IOTransfer is software which is made to give benefits to users in many ways. Main purpose of IOTransfer is to manage iPhone and iPad in an effective manner. This iPhone transfer software is useful for transfer of contents among iPhone and iPad and iPod for Windows system. You can connect your devices with your computer system by using this software and share your photos and videos and other files. It is good to have backup of your photos in your computer system and this software is helpful for this work. You can store your contents in your computer system by using IOTransfer. The process is simple as you need to install this software and then run it and communicate with the computer system to have sharing of desired files. This is a good iPhone to PC and management software. IOTransfer is helpful in management of all types of photos. You can take photos by using your iPhone and iPad and store them in your computer. With some clicks your photos will be stored in your computer system and you can remove them from your iPhone and iPad in order to have more space for taking more photos. When you are moving photos to computer system then you can delete them easily from your iPhone and iPad in order to have more space and good working and you have more free memory. The process of exporting of photos and importing of photos is fun and easy with the help of IOTransfer. When you have this software then you are not required to have any other software as it is complete in its working. 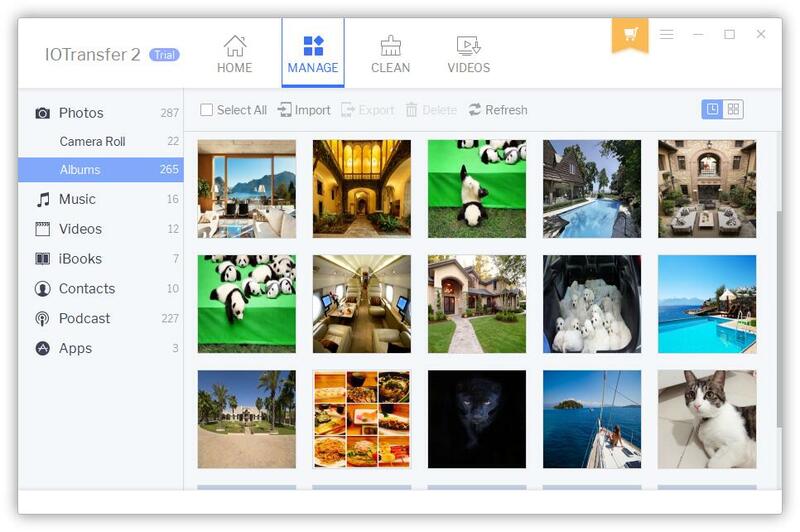 Now you can have photos from one device and share them with many devices at a time. Speed of working of IOTransfer is fast and it is light software due to which there is no burden on your device. You just need to install it and run it to manage your photos with ease. IOTransfer is helpful in management of music files. You can transfer music files among iPhone and iPad and computer system and share them easily. It is a good way to enjoy music in any type of device. You can easily and accurately transfer music files in a short time period to the desired device and store it to have fun. With some clicks your music files will be transferred to the desired device and you will be able to run it and listen to it and enjoy it. IOTransfer is working well for using and management of all types of music files. Due to fast speed and accuracy of this software it is possible to reduce time in transfer and also have more space in the devices. When you want to remove music files from one device then you can do so through this software. 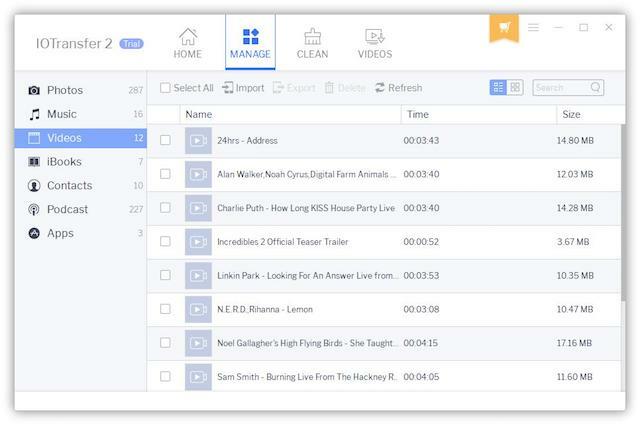 This will increase space for new files to come and give you more options for getting new music of your choice. 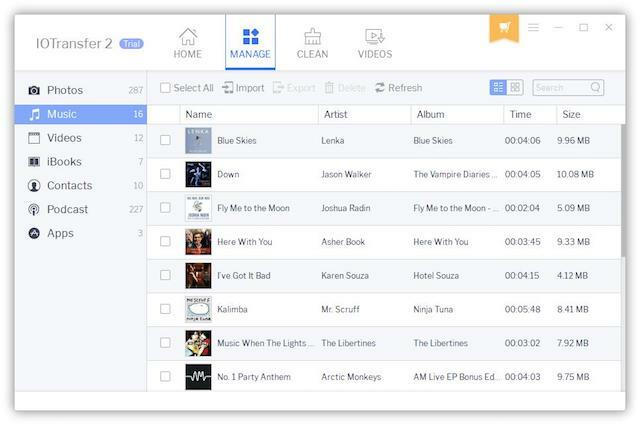 Management task related with all types of music files is easy when you are using IOTransfer. IOTransfer is helpful for proper management of videos and movies. You can have movies in your computer system which you want to have in your iPhone and iPad. You can transfer them to your desired devices with the help of this software. When you have movies in iPhone and iPad and you want to have them in your computer system then you can transfer them easily through this software. The process is simple and fast and can be done with drag and drop. Now you can have your desired videos and movies on your favorite devices. You can store the movies of your choice and enjoy them when you want. You can have videos in your devices and use them when needed. IOTransfer is working well with different types of devices for management of videos and movies for users. In addition to transferring videos between iPhone, iPad and computers, there is a free Online Video Downloader in the program, which supports downloading videos from 100+ media sites, like YouTube, Instagram, Vimeo, etc. IOTransfer is helpful for management of all types of data for iPhone and iPad users. You can transfer your data to your computer system with the help of this software. It is good to have backup of data including contacts and messages to remain safe from problems in case your iPhone or iPad is not working well or it is lost or damaged due to any reason. With a good backup of your data in iPhone or iPad you are able to remain safe from problems. Important data and contacts in iPhone and iPad must be saved in computer system so that it can be used when needed. IOTransfer is useful software which is working well for storing all types of data and keeping it safe to be used when needed. Just with some clicks you are able to have your important contacts saved and important messages stored in your computer system. IOTransfer is reliable iPhone manager which is good for the users of iPhone and iPad. With this software you can have easy sharing and transfer of your desired files at any time. You can install this software and share your file from iPhone and iPod with computer system. You can have a reliable backup of your files so that you can use them when needed. You can manage all types of files with some clicks with the help of this software. Working of this software is easy and it is made in a user friendly manner. You can try this software in trial version to check its features and get benefits. This software is working well for all types of iPhone and iPad devices. When you have IOTransfer then you can do many types of tasks and you are not in need of installing many software programs which can only do some functions. Download IOTransfer now to try the awesome features.